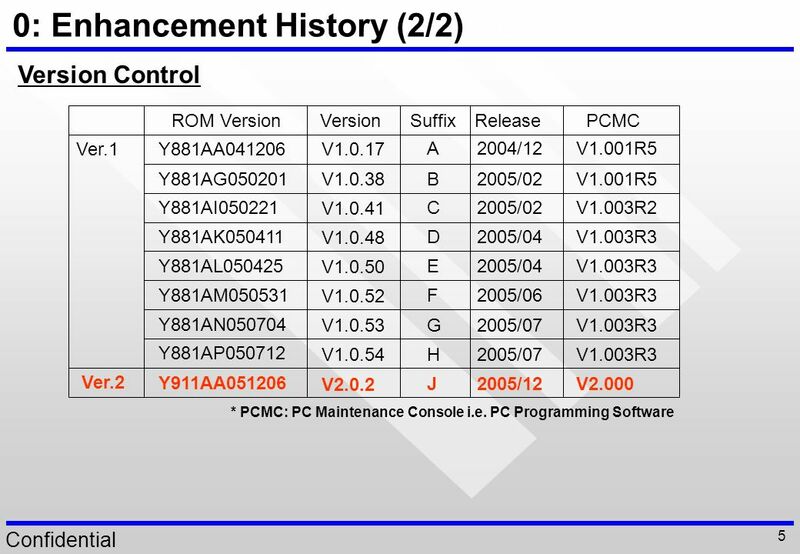 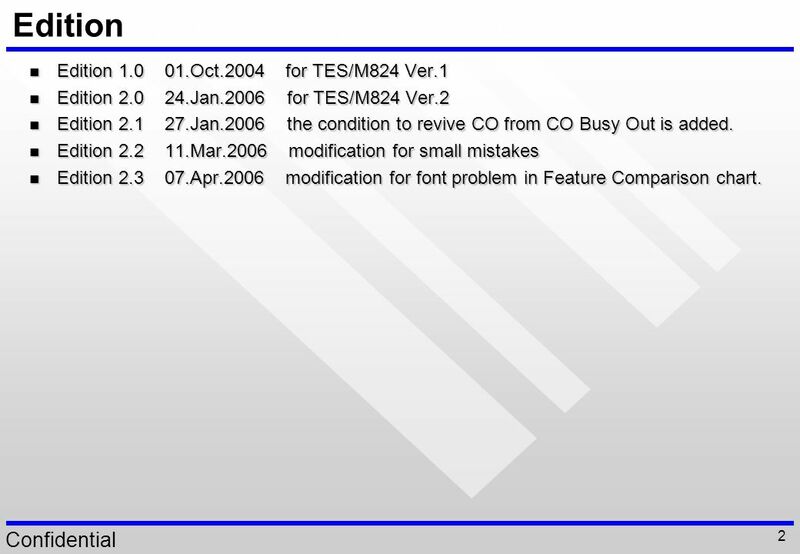 Edition Jan for TES/M824 Ver.2 Edition Jan the condition to revive CO from CO Busy Out is added. 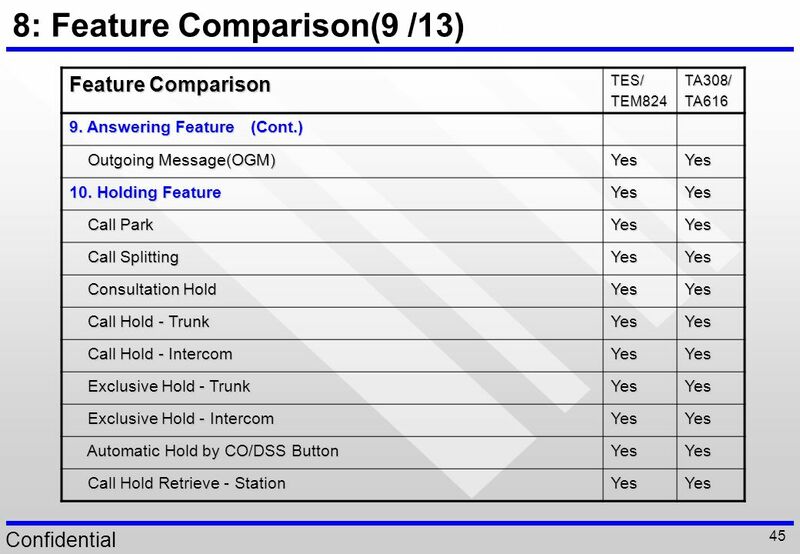 Edition Mar modification for small mistakes Edition Apr modification for font problem in Feature Comparison chart. 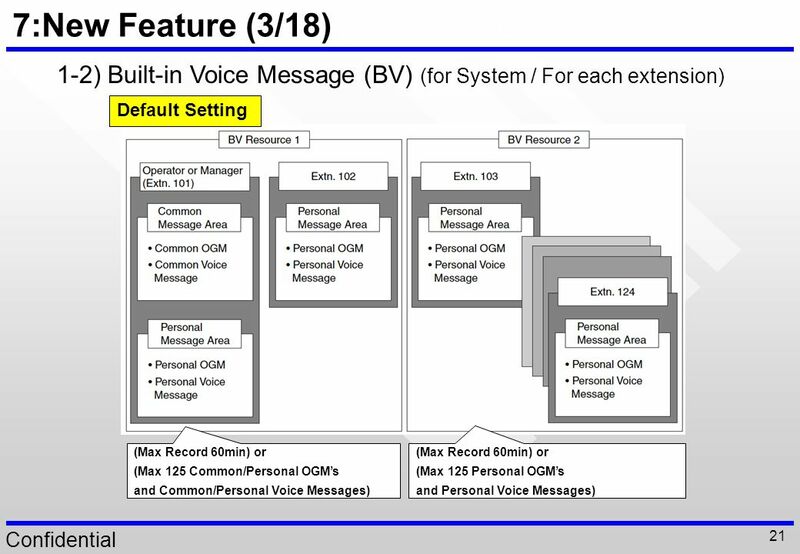 20 7: New Feature (2/18) 1-1) Built-in Voice Message (BV) (for System / For each extension) We have 2 kinds of Voice Message. 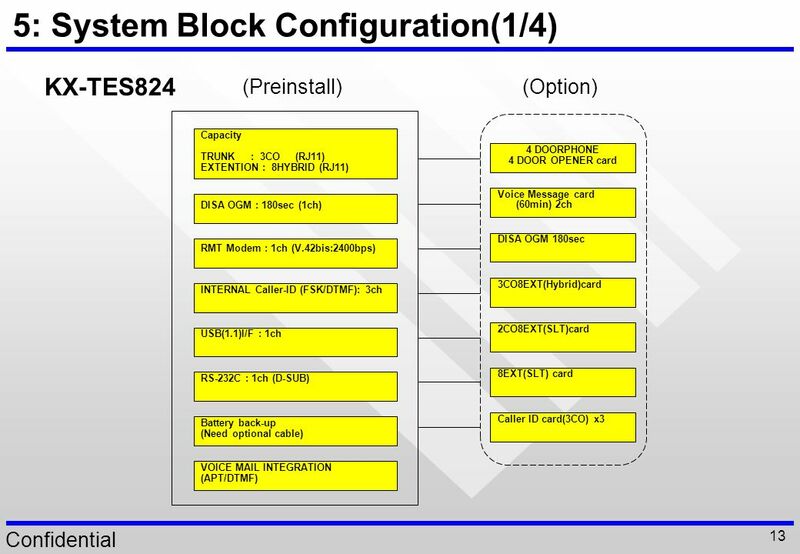 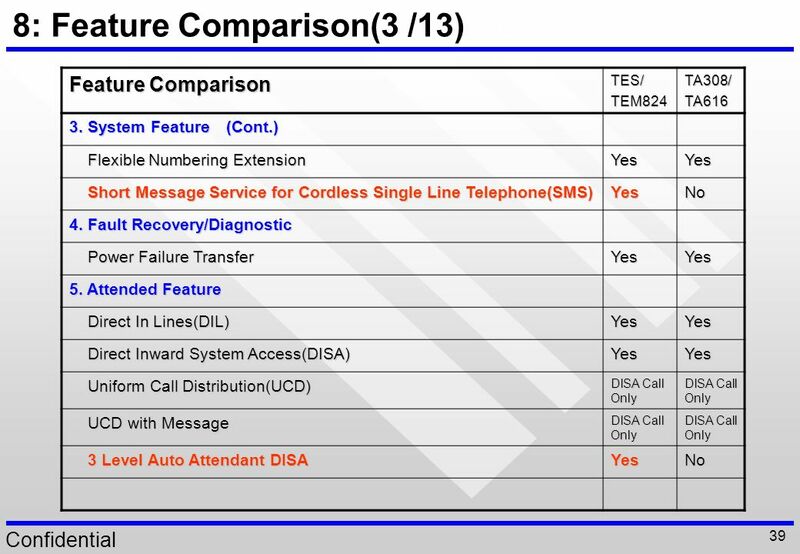 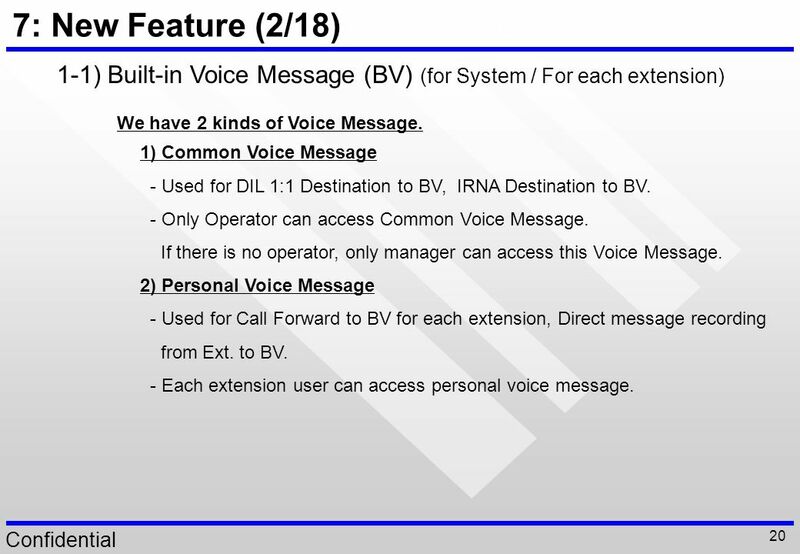 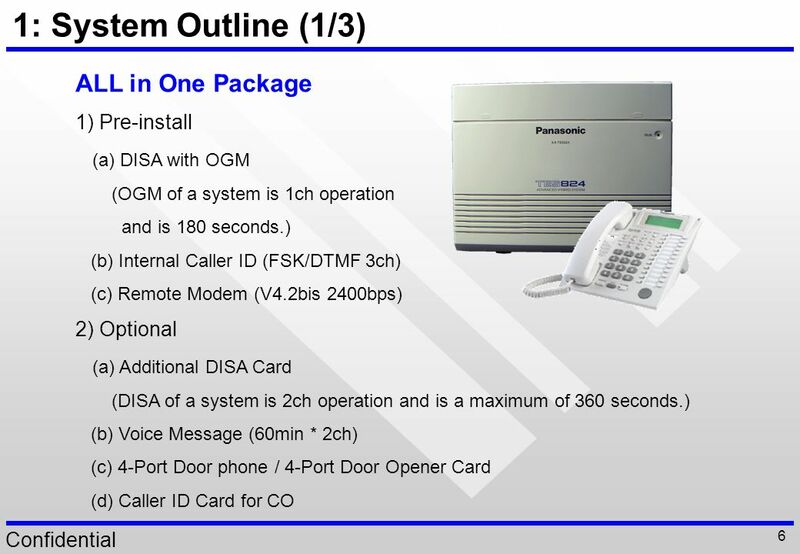 1) Common Voice Message - Used for DIL 1:1 Destination to BV, IRNA Destination to BV. 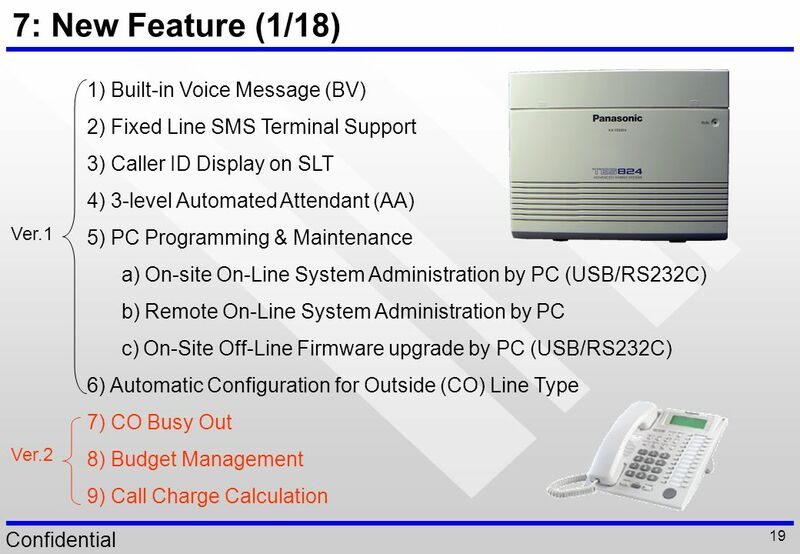 - Only Operator can access Common Voice Message. 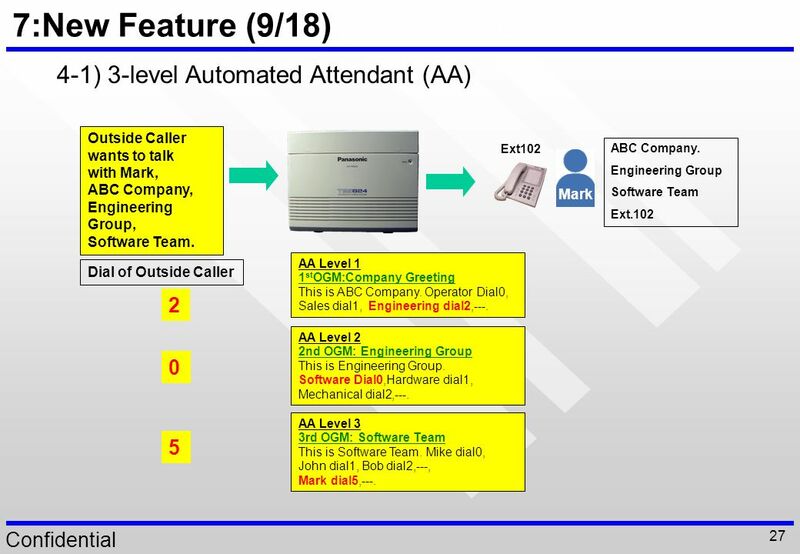 If there is no operator, only manager can access this Voice Message. 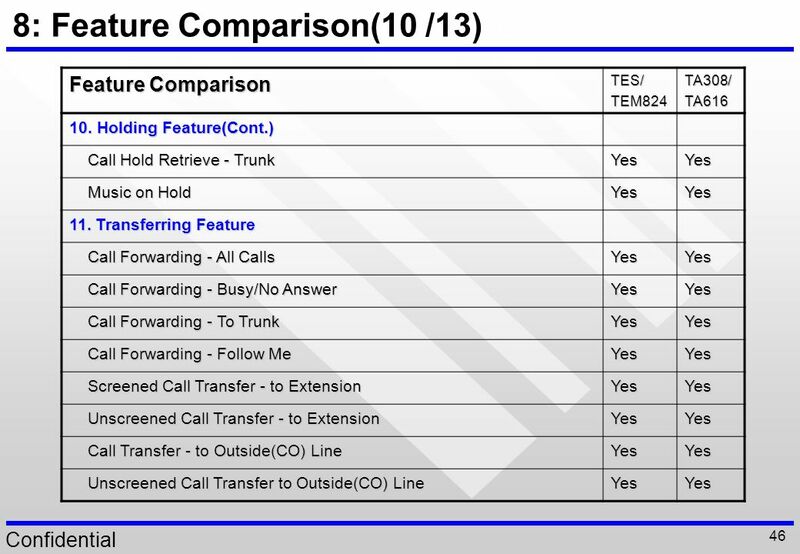 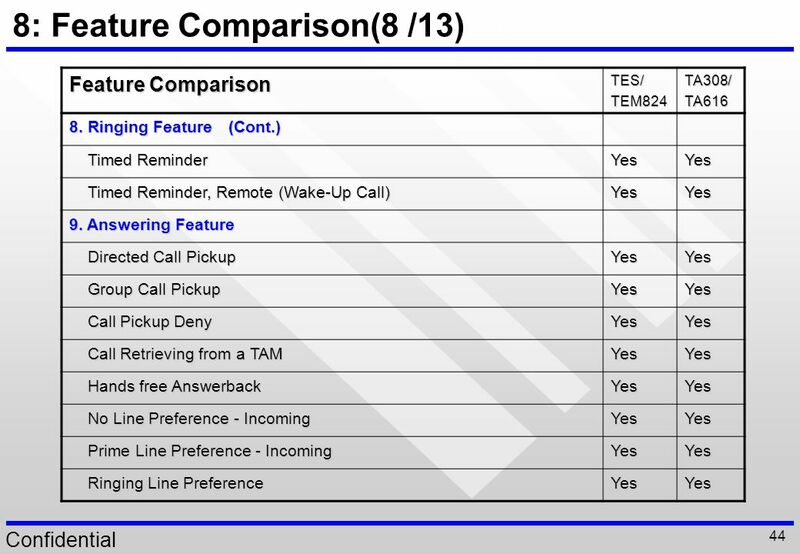 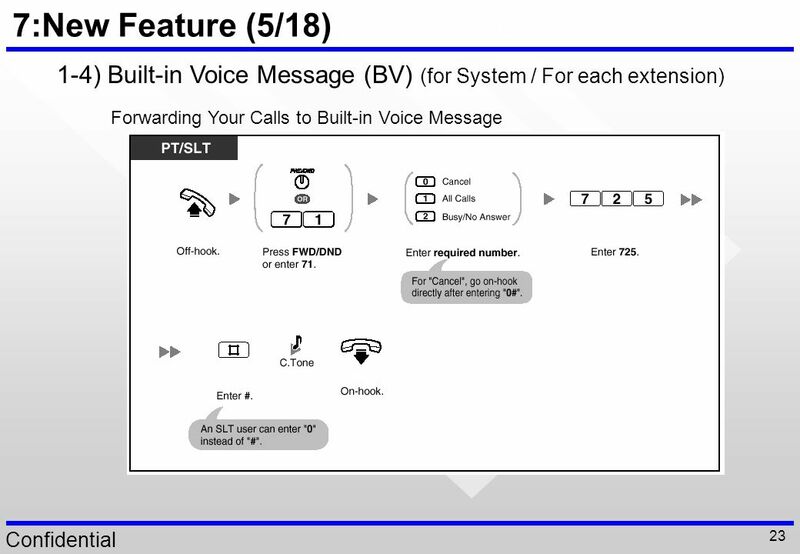 2) Personal Voice Message - Used for Call Forward to BV for each extension, Direct message recording from Ext. 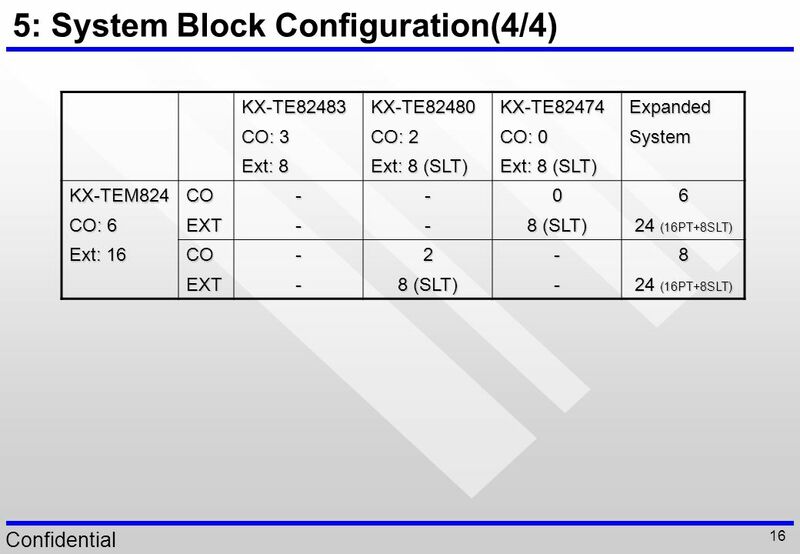 to BV. 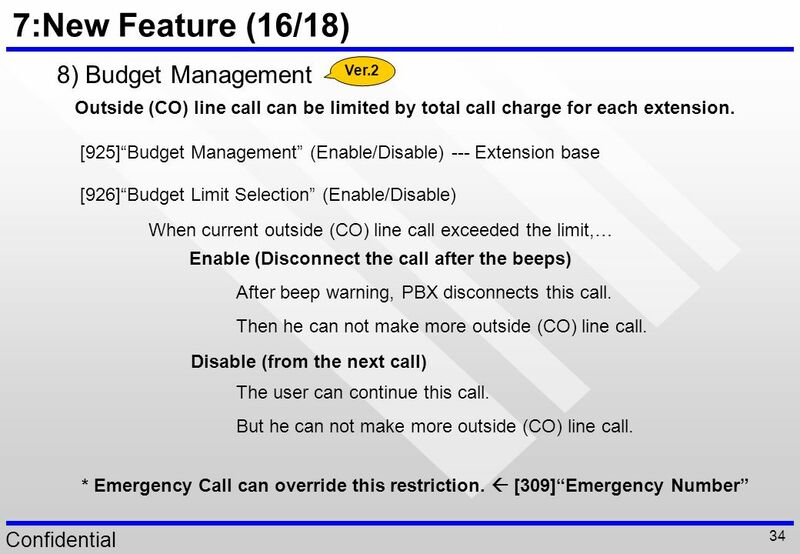 - Each extension user can access personal voice message. 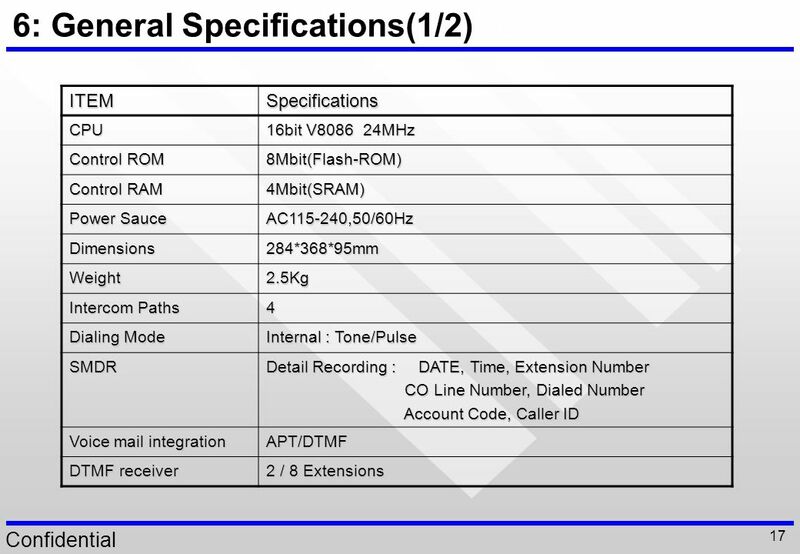 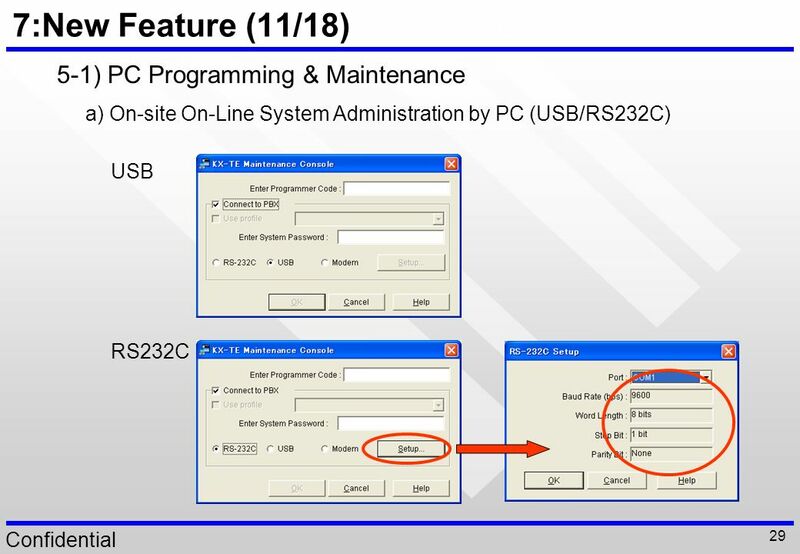 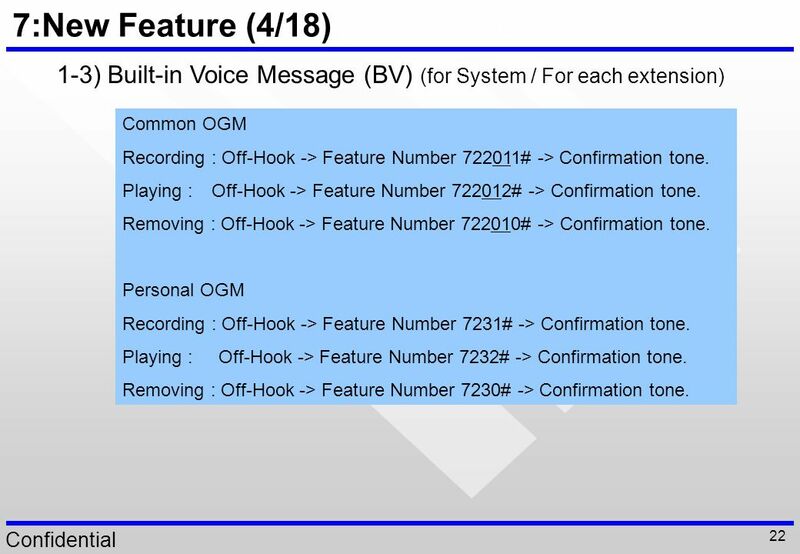 22 7:New Feature (4/18) 1-3) Built-in Voice Message (BV) (for System / For each extension) Common OGM Recording : Off-Hook -> Feature Number # -> Confirmation tone. 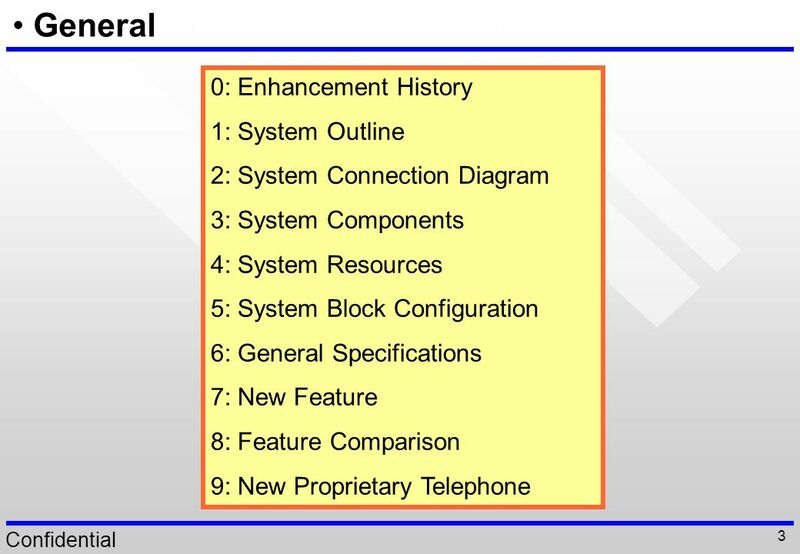 Playing :	Off-Hook -> Feature Number # -> Confirmation tone. 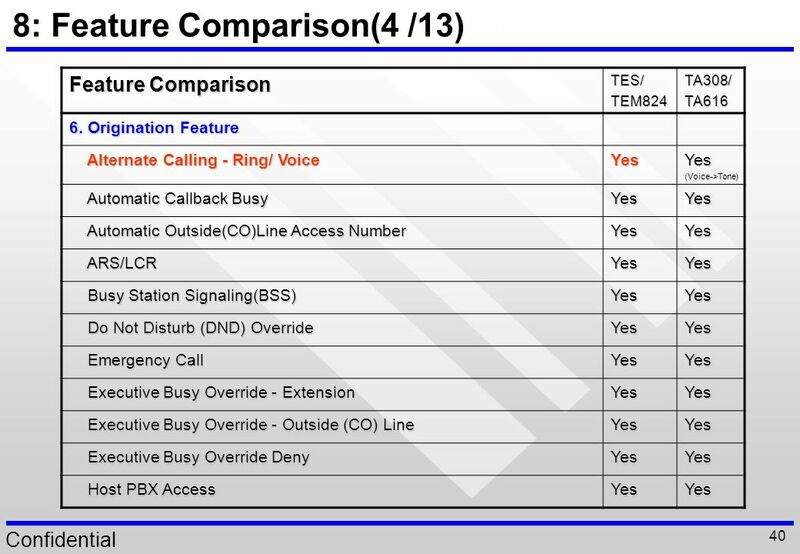 Removing : Off-Hook -> Feature Number # -> Confirmation tone. 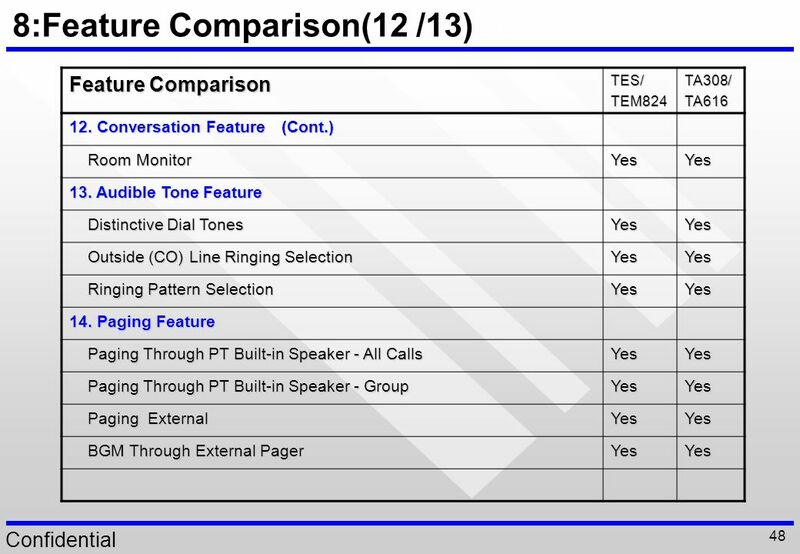 Personal OGM Recording : Off-Hook -> Feature Number 7231# -> Confirmation tone. 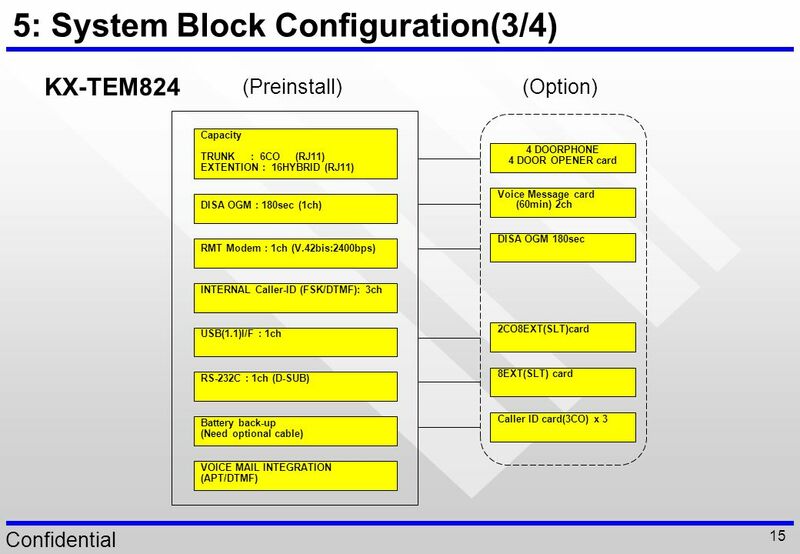 Playing : Off-Hook -> Feature Number 7232# -> Confirmation tone. 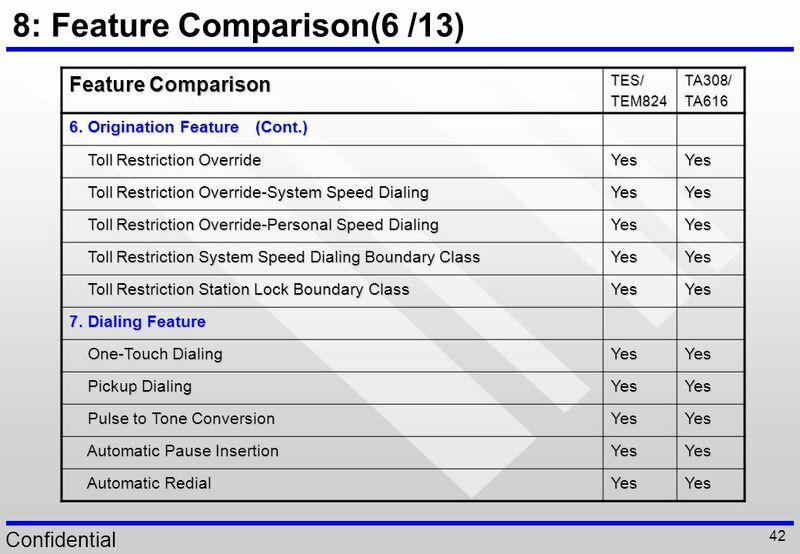 Removing : Off-Hook -> Feature Number 7230# -> Confirmation tone. 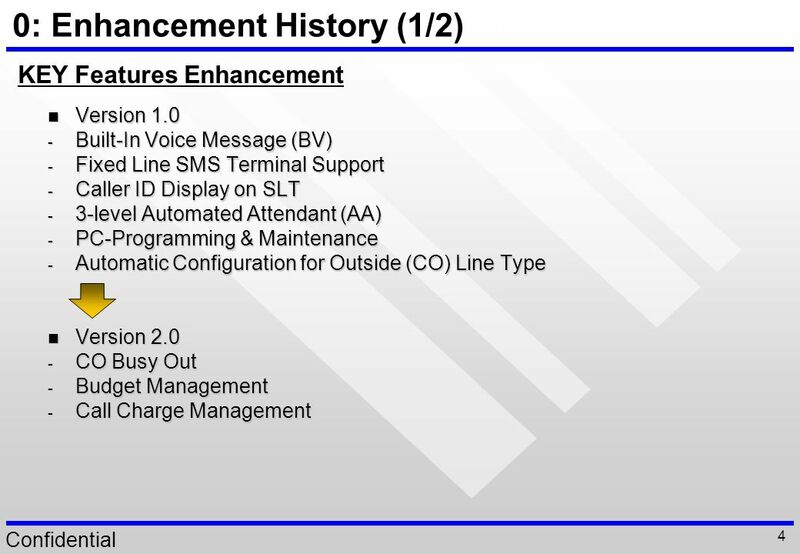 24 7:New Feature (6/18) 2-1) Fixed Line SMS Terminal Support (Short Message Service) SLT Extension which supports SMS feature PSTN 3) 1) 2) Short Message Center CID= SMS Routing feature Sequence When Someone sends Short message to SLT extension in KX-TE, Short Message Service Center(SMS center) receives the message. 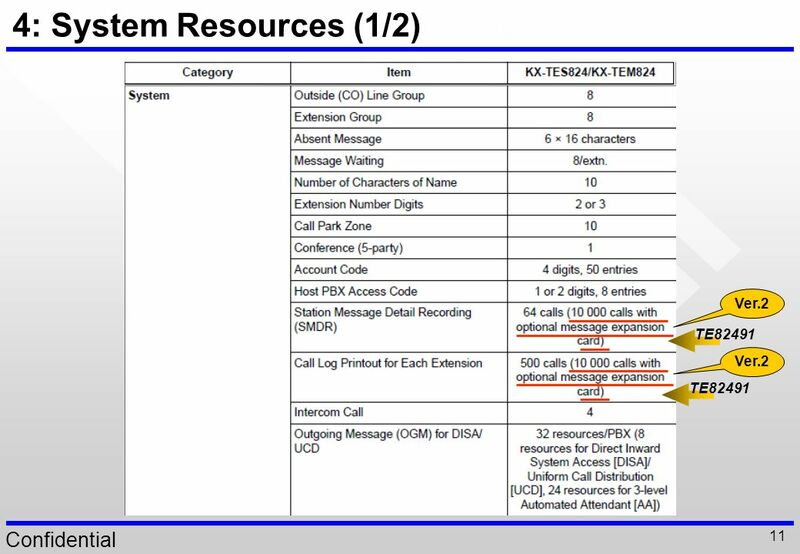 SMS Center makes a call to KX-TE line. 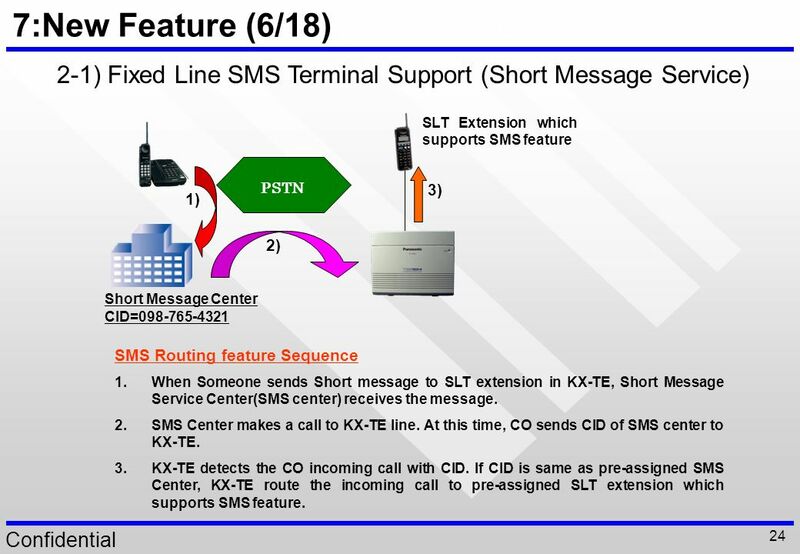 At this time, CO sends CID of SMS center to KX-TE. 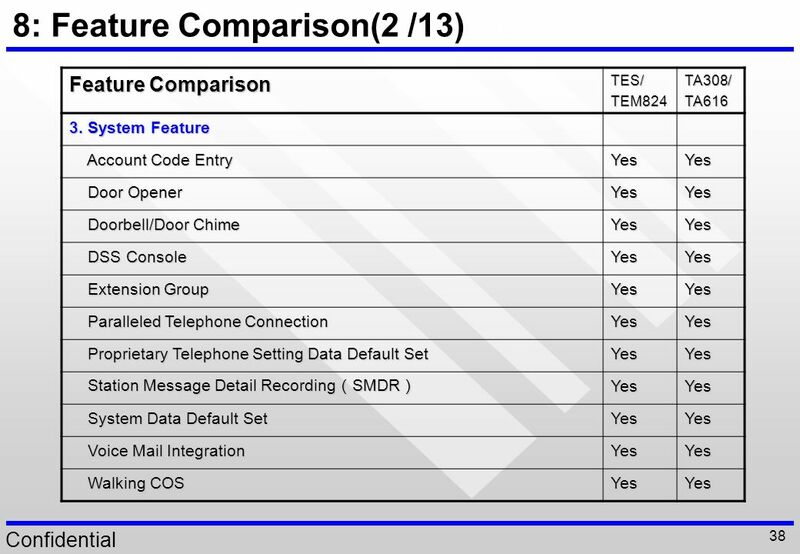 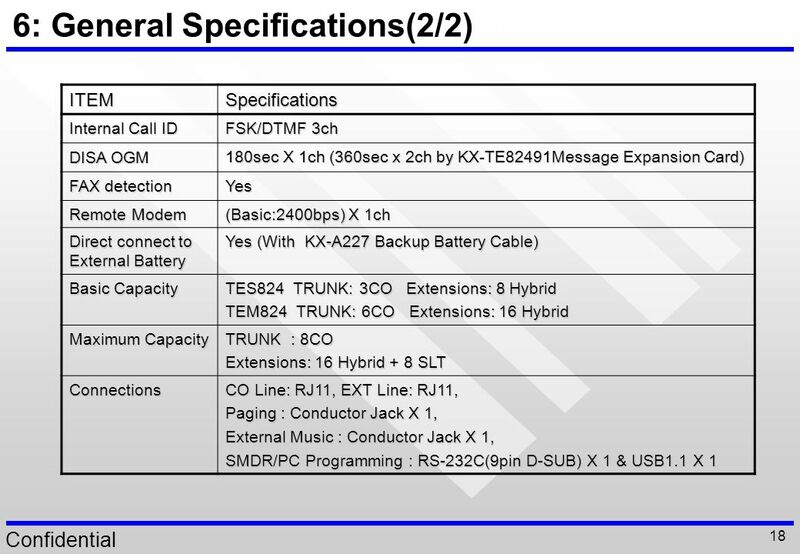 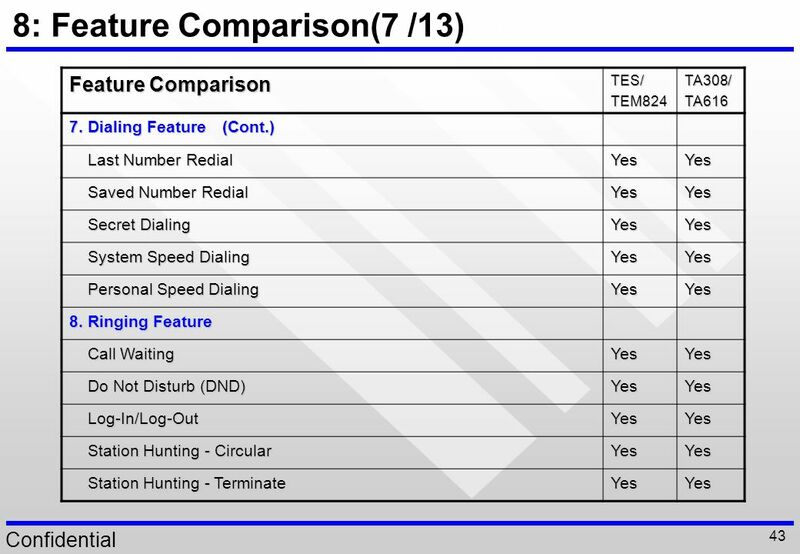 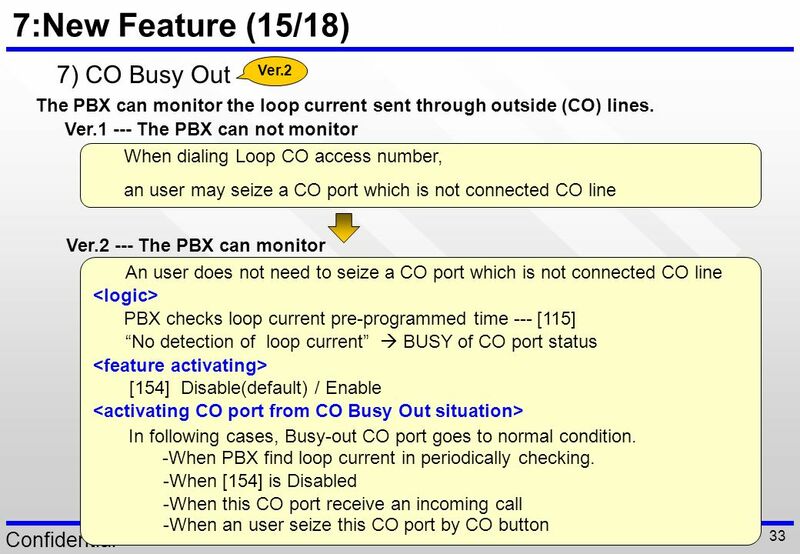 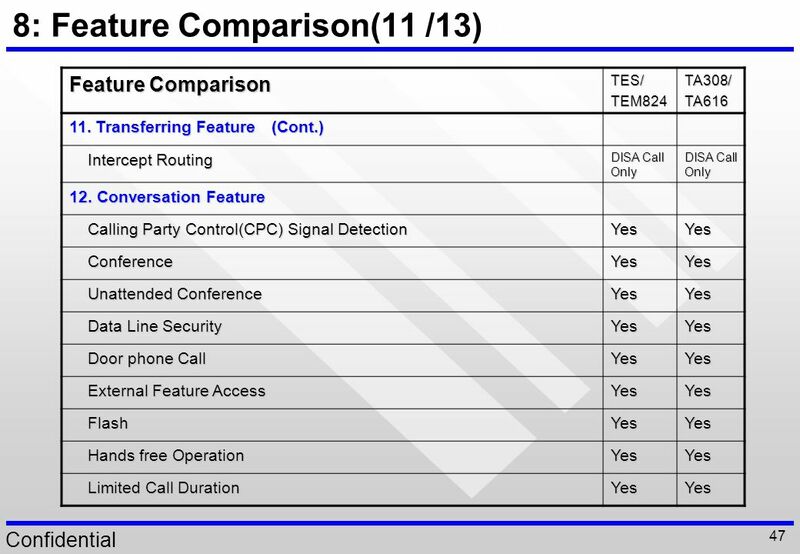 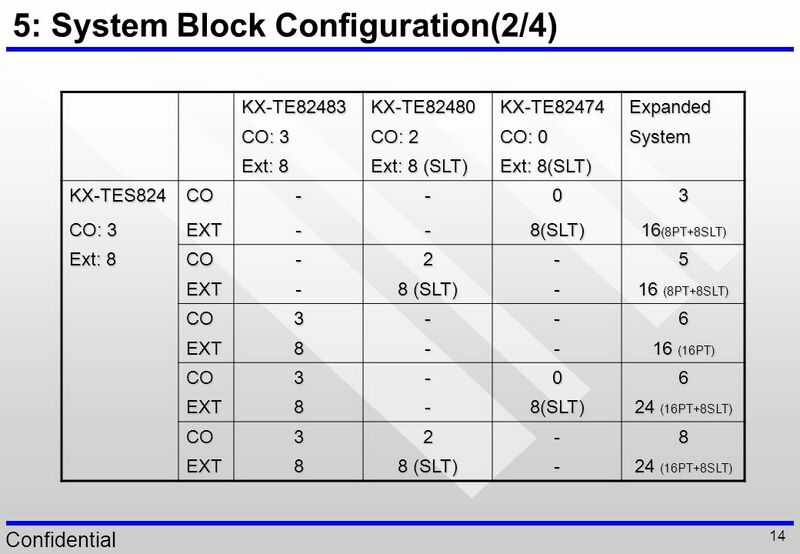 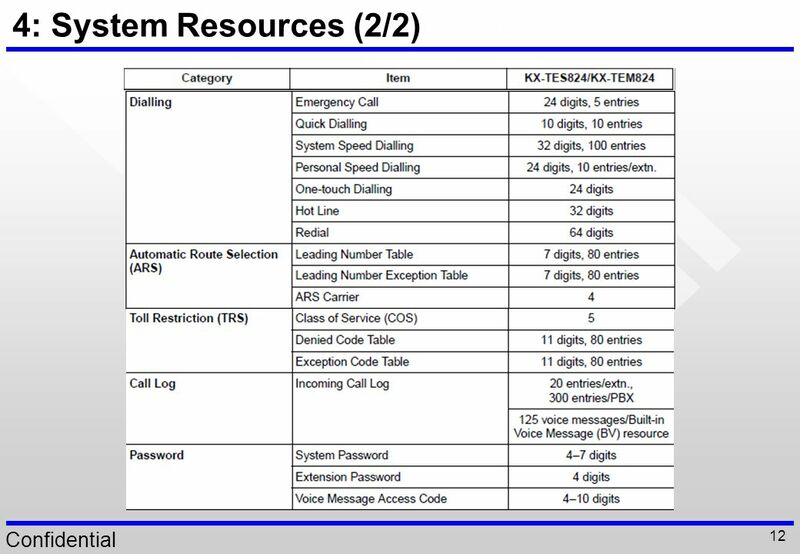 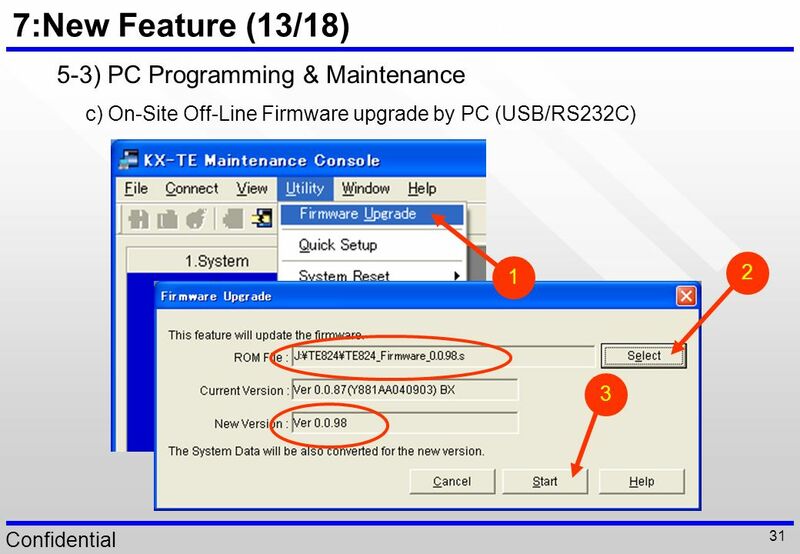 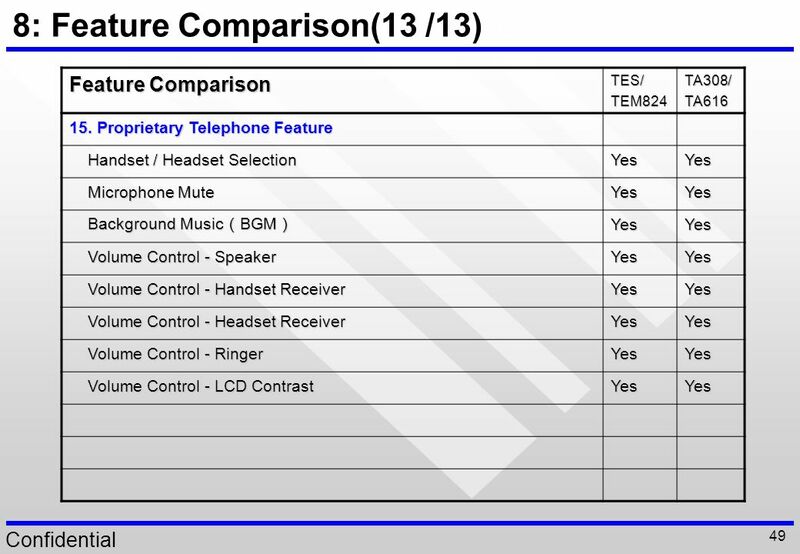 KX-TE detects the CO incoming call with CID. 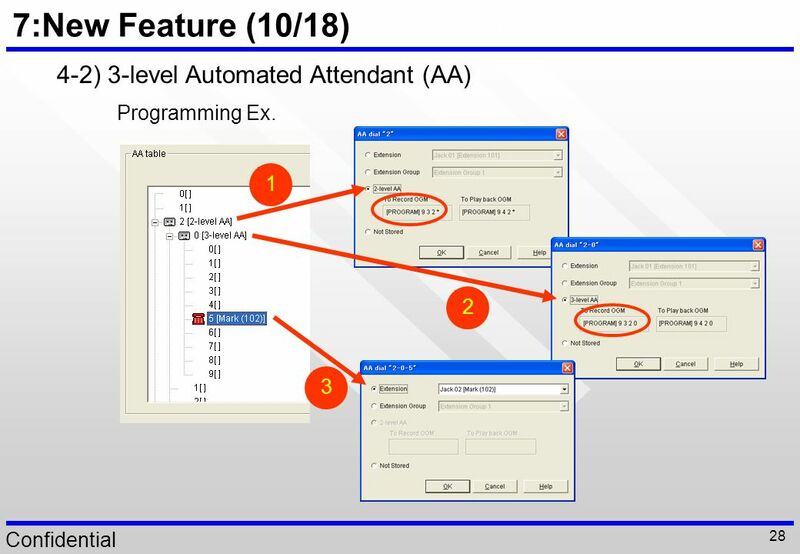 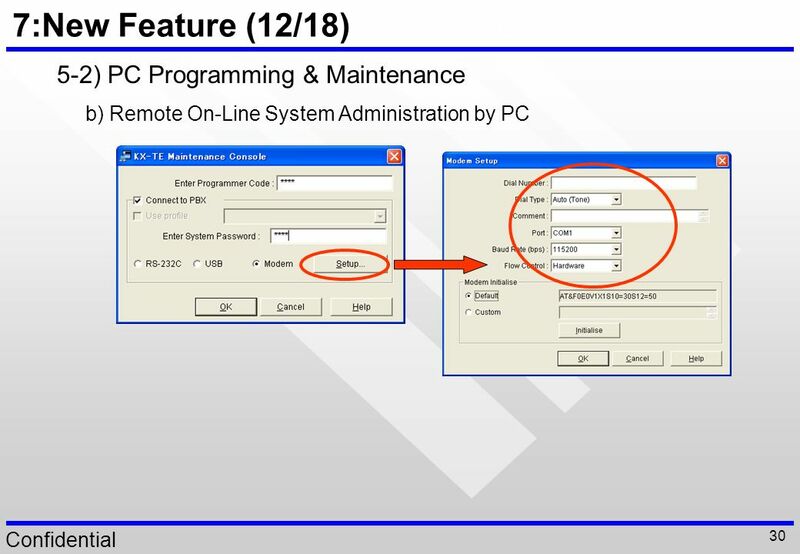 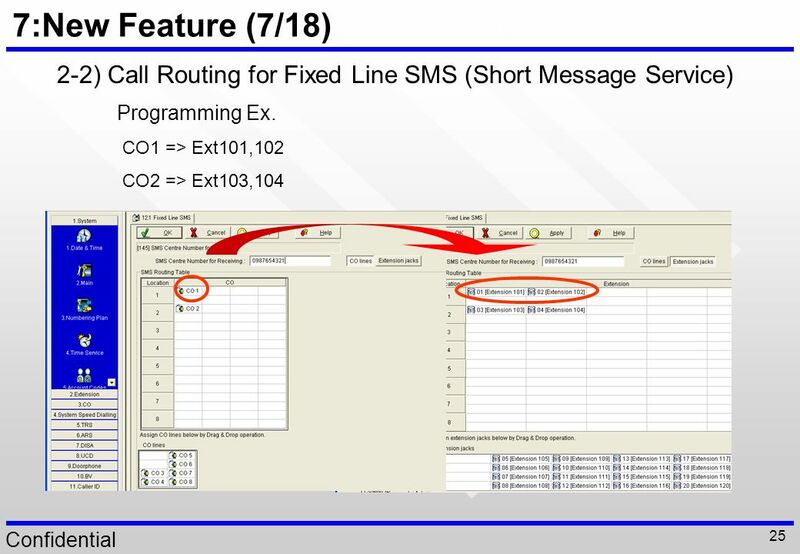 If CID is same as pre-assigned SMS Center, KX-TE route the incoming call to pre-assigned SLT extension which supports SMS feature. 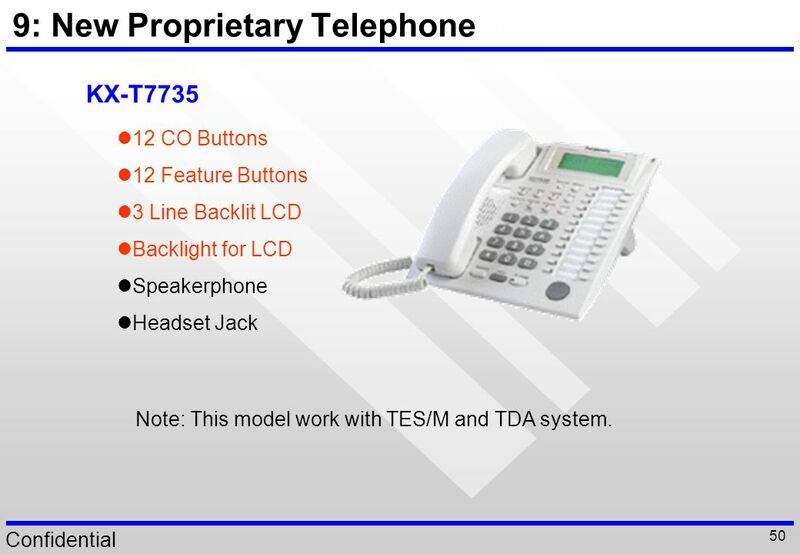 KX-T7735 12 CO Buttons 12 Feature Buttons 3 Line Backlit LCD Backlight for LCD Speakerphone Headset Jack Note: This model work with TES/M and TDA system. 51 Thank you very much ! 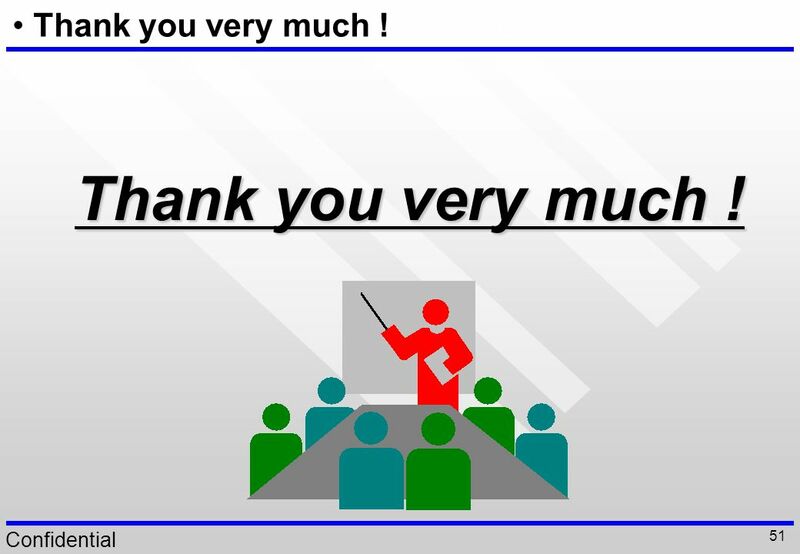 Thank you very much ! 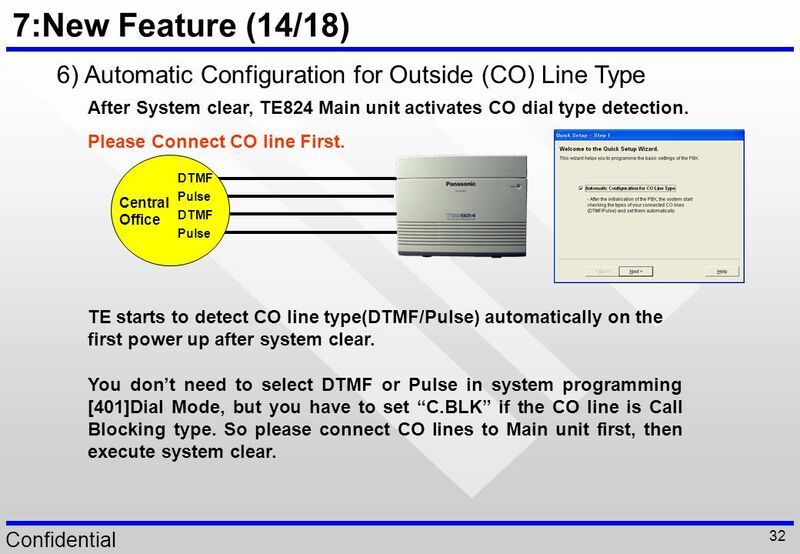 TDA30のみで実現した下記の項目どうする? 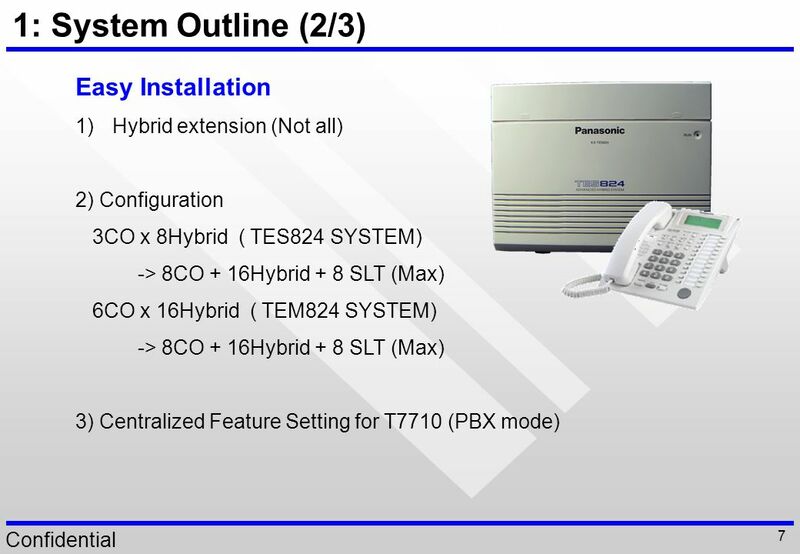 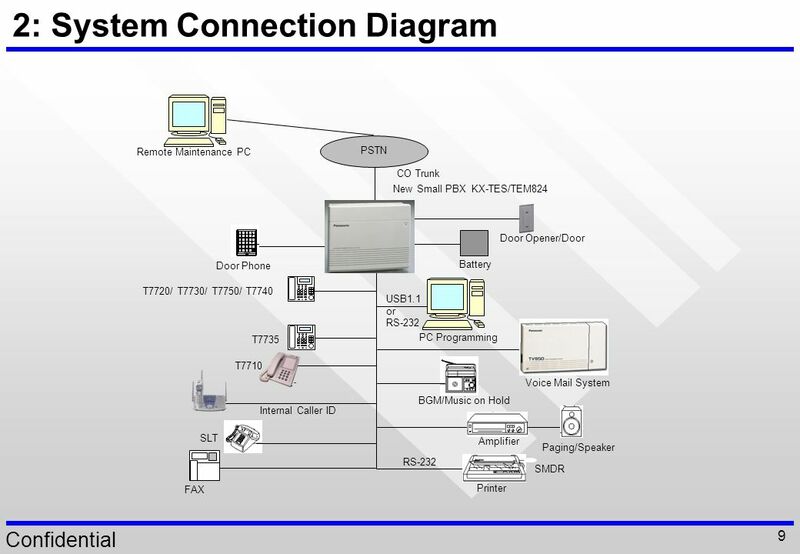 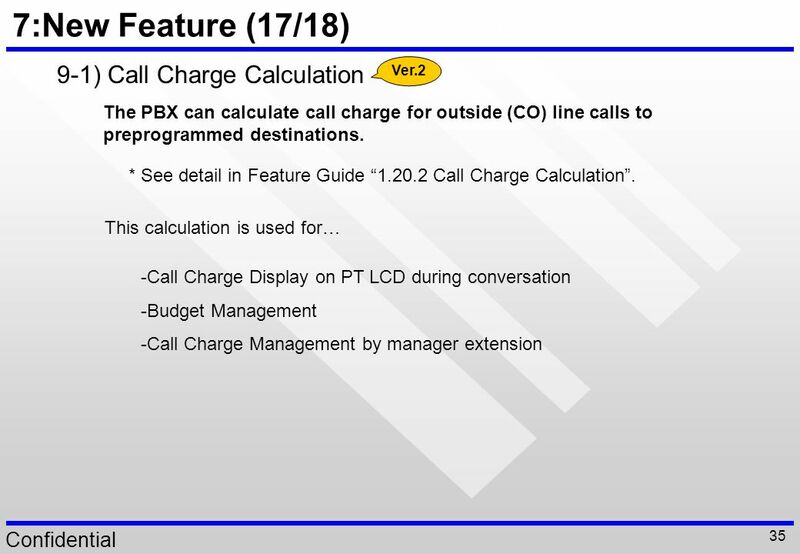 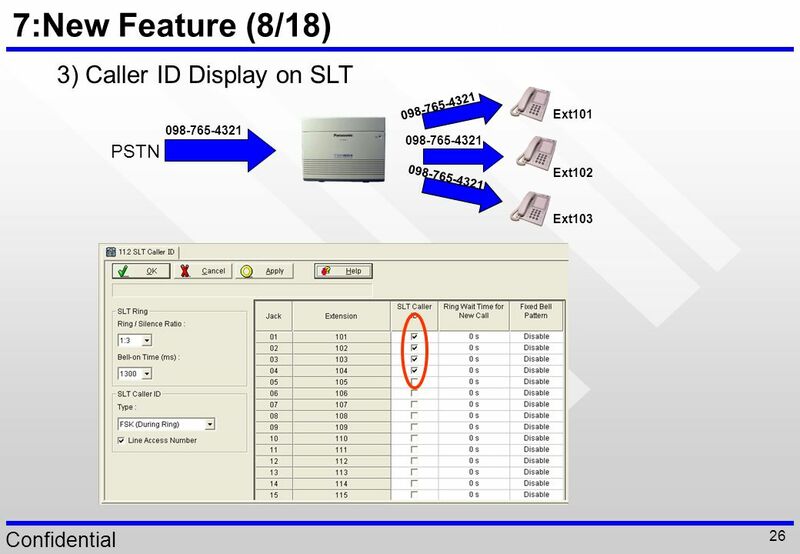 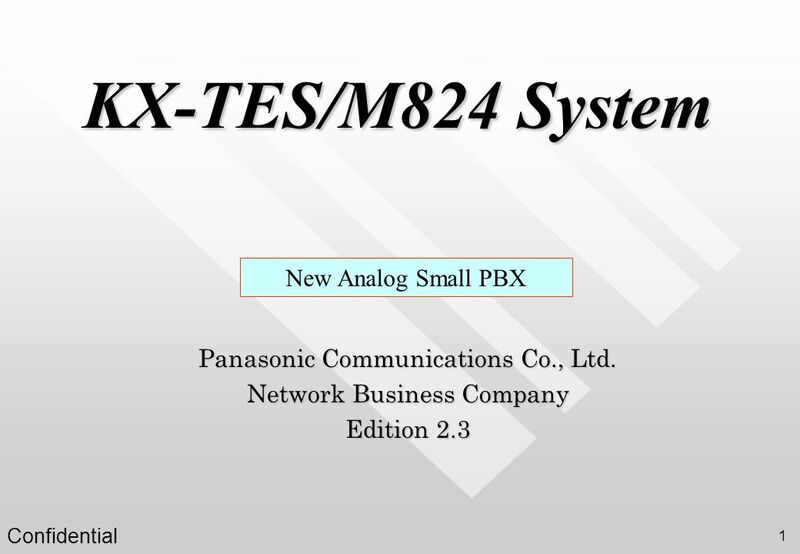 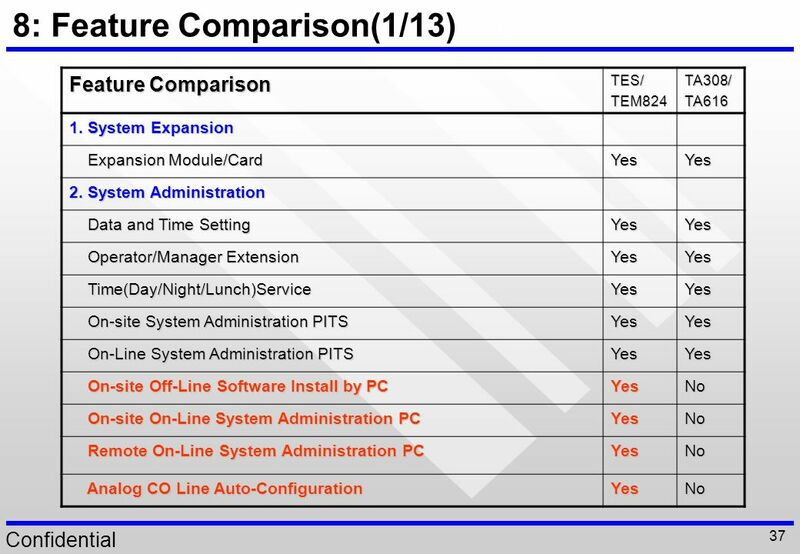 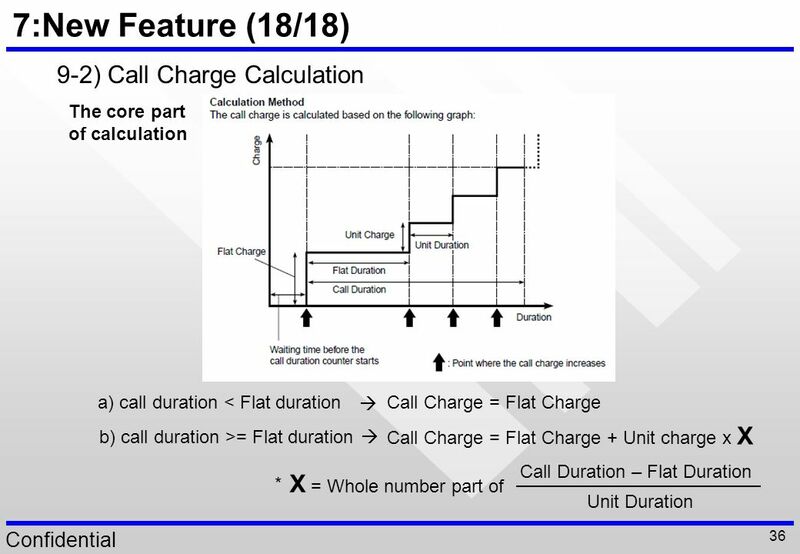 Download ppt "KX-TES/M824 System New Analog Small PBX"
Outline of the Nine Key Elements of ACD Automatic Call Distribution Agent Agent Groups ACD Routing Queue Announcements Supervisor Positions Flexible. 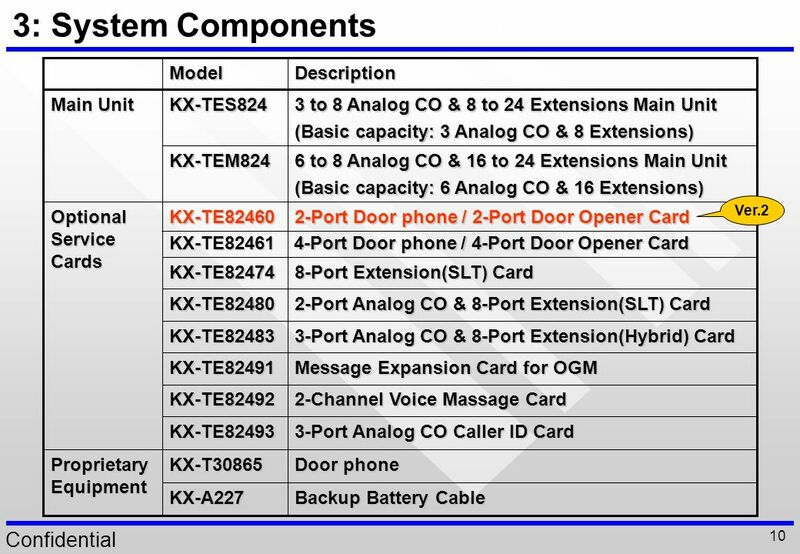 Aspire Vertical Markets Manufacturing and Warehouse Solutions.